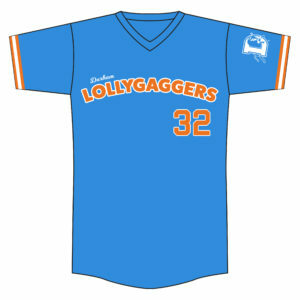 As a tribute to a memorable scene in Bull Durham, the Durham Bulls (Class AAA; International Leageue) will play as the Durham Lollygaggers on June 14. Over the years, the Bulls have held numerous promotions to pay tribute to Bull Durham, the 1988 film starring Kevin Costner, Tim Robbins, and Susan Sarandon that depicts a fictional version of the team. The 2019 promotion recognizing Dull Durham will be held on Friday, June 14, when the Bulls take the field as the Lollygagers as part of Lollygager Night. For Lollygagger Night, the Bulls will take the field in Lollygagers uniforms that include a specialty jersey (above) and cap (below). The Bulls/Lollygaggers will play the Scranton/Wilkes-Barre RailRiders that evening, with first pitch scheduled for 7:05. Want inside information on the making of Bull Durham, including an interview with Miles Wolff on the film? Check out Cradle of the Game, Mark Cryan’s book on North Carolina ballparks past and present. You’ll learn how Bull Durham came to be, how the iconic Bulls logo was created and why Pete Bock appears in the film.